Shares of the online travel booker fell after its third-quarter earnings report, in line with many of its industry peers. 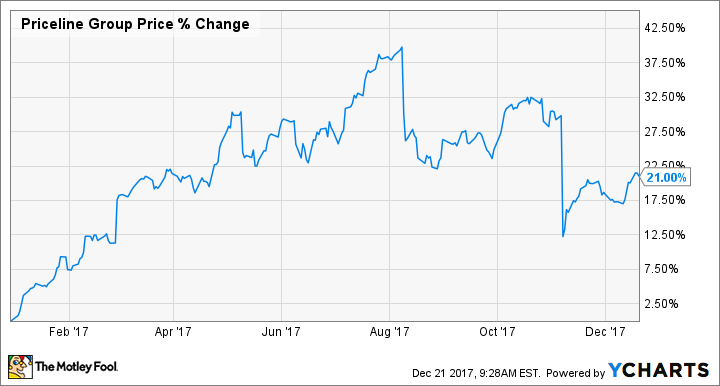 It's been a rough few months for travel stocks, and industry leader Priceline Group (NASDAQ:BKNG) has been no exception. After reporting third- quarter results in early November that disappointed investors, the stock has fallen nearly 15% from all-time highs reached over the summer. While there may be some concern over the future, investors need not worry about Priceline. The third quarter, typically a busy one for the travel industry as it encompasses the busy summer vacation months, was fraught with worry this year, what with hurricanes in the Caribbean and Southeast U.S., earthquakes in Mexico, fires in California, and threats from North Korea. Priceline shrugged off those worries, though, and posted solid quarterly records. The value of total gross bookings on its family of sites increased 18% year-over-year to $21.8 billion. As a result, gross profit was $4.37 billion, a 22% increase over the same period a year ago and easily topping management's guidance. That was positive news, especially considering all of the bad news the travel industry was facing, but it was guidance for the quarter ahead that caused disappointment. Total gross bookings, gross profit, and earnings per share are all expected to decelerate in the fourth quarter. Gross bookings should be in the 9.5%-to-14.5% year-over-year growth range, gross profit is predicted to be up 10.5% to 15.5%, but earnings per share is estimated to be down 4% at the midpoint of guidance. The expected slowdown can be attributed to several factors. In regards to the top line, management said some of its advertising channels have had declining return on investment over the years. Some of the partners have themselves become travel booking sites and are now competing with Priceline. As the company reevaluates various advertising outlets, revenue growth could slow. As for the drop in profitability, much of that has to do with Priceline investing for growth. Most notable among those efforts is the continued buildout of bookable vacation properties on the booking.com site. The total number of properties available was at 1.5 million at the end of the last quarter, 816,000 of which are unique vacation properties like homes and apartments, and Priceline said it will be boosting ad spending for the website. Other areas of investment include the building of new technology and platforms for customers, but all such efforts will eat into the bottom line in the short term. While that cloud of uncertainty may be concerning, it implies that the Priceline Group's management believes it has plenty of growth left in the tank. Time to buy this stock? The catch, however, is that even after the recent decline in Priceline's stock, it still appears expensive. The price-to-earnings ratio based on the trailing 12 months is about 25, implying that those who buy now are paying for nearly 25 years' worth of profits to own Priceline. That doesn't adjust for money Priceline is investing back into the business, nor does it account for other intangible items. Price-to-free cash flow, a more accurate measure of a company's profitability, as it uses cash left over after basic operations are paid for, tells a better story. 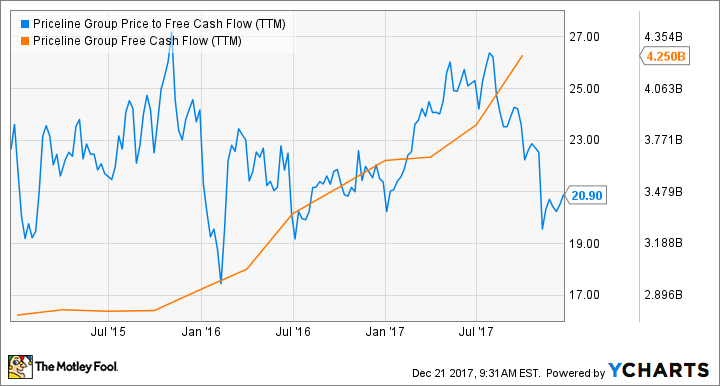 At around 20, Priceline's price-to-free cash flow ratio shows the stock is at a much more reasonable valuation. The recent past also suggests that share prices will rebound from current levels, especially if Priceline's self-investment pays off like it has in the past. Though the guidance given for the current fourth quarter was a significant downgrade from the figures just reported, management still sees the top line rising by at least double digits. That's more reason for optimism. For those investors who were getting nervous after this latest pullback, fear not. This looks like an opportunity to buy more shares.